Although this guy was structurally sound, it was pretty beat up! I am pretty darn good and fixing and patching but it would have taken forever to try and make this "perfect", so I went with the imperfections and gave it more of a rustic feel. The original wood hardware make this piece look very Art Deco, which wasn't the look I was going for. After removing the hardware, patching up any major spots and planing down the drawers to slide and fit nicely, it headed off the the sanding booth! I really didn't know what I was finish I was going to end up with. After a base coat of a pretty blue/gray color I did a black glaze. I softened up the black glazing by doing a SUPER light whitewash over top of that then followed that with a soft champagne metallic glaze. Didn't really want it to be too metallicy, but did want a little something. Few coats of clear lacquer sprayed on and it is good to go! I keep all of my old hardware and found the perfect pieces for this piece. Love how it turned out! Although I have done a whitewashing technique before, this is the first time I have done it for a customer. 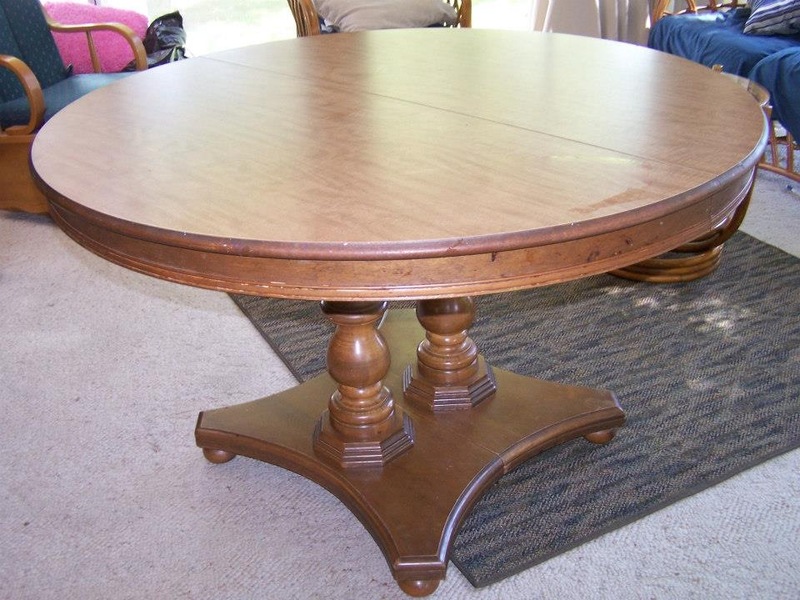 She purchased this table on Craigslist for a great price. It had 2 leafs and a pretty base. Just needed some love. She had a good idea and few pictures of what she wanted which helped tremendously! She was looking for a whitewashed, "driftwood" look and feel. There are 2 leafs that came with the table, which I whitewashed as well. I always do the leafs at the same time especially when doing any sort of faux treatment. I actually put the leafs in the table (leaving gaps btwn) to work with it almost as one large table. That way you get the most consistency. After I sanded, primed and sprayed the table in a dark gray base, I began the whitewashing. I am sure there are many ways to do it but I like to use about %50 paint to %50 water. You will also need a towel to remove most of the paint and I like to use a rough brush, like a chippy type brush. A super nice, smooth Purdy brush will not give you the striations your looking for. Dip the brush in the whitewash mixture just a bit, wipe most of the paint off on the rag and start your strokes. Mixing it with water helps to keep it moving a little bit and have more continuous strokes. After it dried a did a LITTLE bit more random whitewashing over top, just for extra depth. Let dry, few coats of clear lacquer and it's done! I typically do not buy pre painted pieces to refinish but the current paint job on this guy, although not pretty, was actually done nicely. 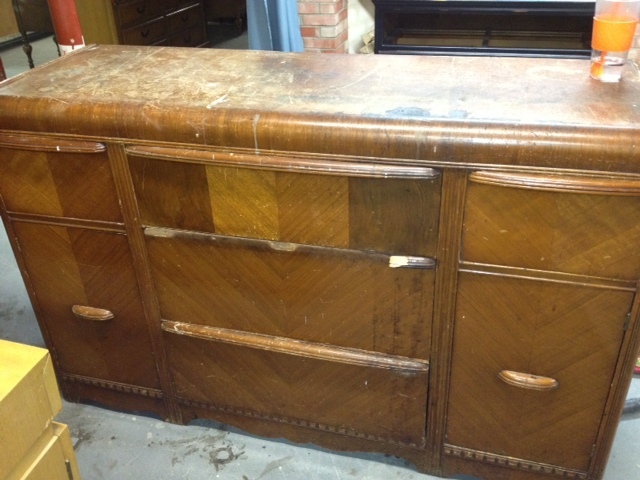 Also, it was solid wood, had dovetailed drawers and pretty, pretty curves…it was coming home with me! I knew right away that this was going to be a piece that I was not going to put on my site as a custom option, but to refinish and sell myself. Not sure why or how I choose these pieces, I just know right away with random pieces. As always, the hardest part was deciding what color to use. I swore I would not be mixing colors myself anymore but here I was again… breaking my own promise! I had a color in my head that I wanted and just added a little this and a little that until I achieved the color. Kind of a coral/salmon shade. 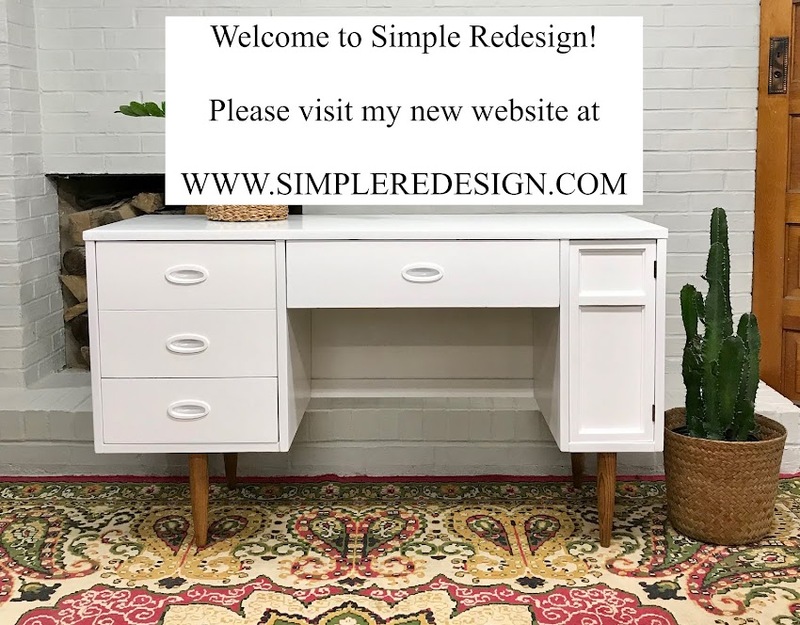 Instead of using the traditional French Provincial hardware, which was my first choice because I did have enough for this dresser, I really liked this hardware and wanted to do something a little different. Because the hardware I chose had too much gold going on, I did spray them with a light coat of oil rubbed bronze, whipping %50 off right way, just so a bit of the gold was popping thru, highlighting them.